By Hood. Pack for the One-Man Raft, Pneumatic, type C-2. 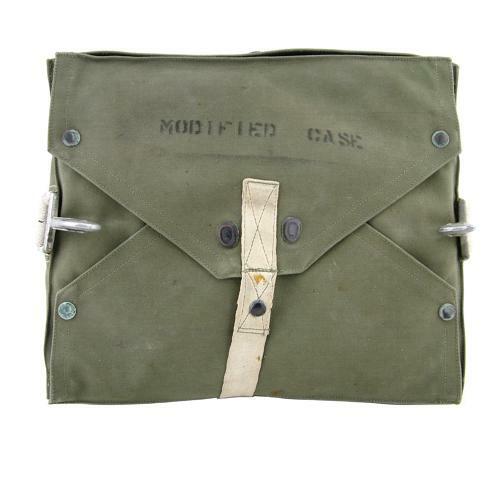 Manufactured in heavy olive drab canvas. This is a 'revised' pack on which the large cadmium plated snap hooks have been reversed to face the upper side. This modification alleviated the problem of the pack accidentally opening if the pilot baled out. Fitted with lanyard/snaphook and has sewn cloth loops for attachment of a seat cushion. The canvas is in excellent undamaged condition and well stamped. Date of manufacture is June 1944. Packed with foam to give shape but supplied empty. Stock code S23152.